It’s an awkward question that might not cross your mind very often: who made my clothes? It’s a question that haunted fashion designer Charlie Ross ever since she discovered the horrors behind the many garments that hang snugly in our wardrobes. From clothes that carry harmful pesticides that won’t come out after a normal wash cycle, to farmer suicides prompted by the promise of the “miracle” GM cotton plant, which failed to deliver; from child labour to environmental pollution: “It’s such a massive issue, it’s like, where do I even start?” she said, shocked at some of the unscrupulous systems in place to satisfy fast-fashion manufacturers and consumers. She has been keen to stay ethical in the fashion industry since her first year of university after watching the documentary China Blue that reveals the harsh working conditions in a blue jeans factory in Southern China. As Charlie looked into it more, she found that many UK buyers tend to not think twice about the “Pandora’s box” of problems behind our everyday clothes. Now, she finds it hard to go shopping for clothing herself, preferring second-hand, organic cotton or new fabrics made from things like banana fibres. “When you learn it, it’s really hard to unlearn it,” she said about the unethical practices she has encountered. As a fashion design graduate, Charlie found it difficult to source fabrics and textiles that were both trendy and ethical. Many others were hungry for the same. 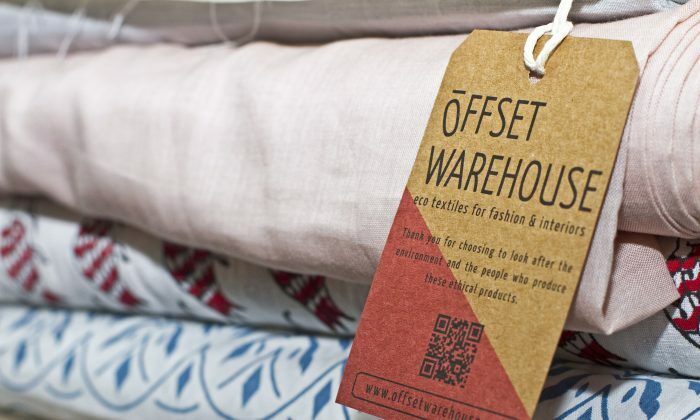 So six years ago, she set up an eco-textile business which she runs from her home, called Offset Warehouse, that fills an eco-fabric niche in the market. Her passion and energy to change the fashion industry for the better propelled her to make Offset Warehouse a success. After setting up and working on it part time, Charlie immersed herself in the business, working full time for long hours, from 6 a.m. until 11 p.m. Now she hires two full time staff and works more balanced hours. Having grown up in Japan, South Korea, Hong Kong, and Singapore, she has an affinity with Asia and sources most of her fabrics from India, Cambodia, Thailand, and France. She makes sure all the people making the fabrics are paid well and have suitable working conditions. She’s worked hard to get a broad range of eco-fabrics available for designers, that include banana fabric, recycled polyester, and hand-dyed cotton. Some are hand woven while others are machine produced. “There’s always a pro and a con with any fabric, so I was keen to offer a broader range,” she said. Supply chain transparency is a big problem for many clothing companies, with slave labour and outsourcing of production meaning you don’t really know who is making the fabric or garments. “I know who is weaving our fabric,” she said. She loves fabrics and meeting the people who make them. As well as selling the fabrics, Charlie gives lectures to designers to help educate them about ethics in fabric production. If they can make decisions so “it’s not making a negative impact on anybody, it’s one step in the right direction,” she said.